This precious white cotton dress was hand made in the Philippines in the 1930s. A rare example of an unworn 1930s embroidered dress, it was removed from its original packaging and washed and pressed so that it arrives fresh and ready for baby to wear. It features delicate pink and blue embroidery and pintucks on the bodice, with a scalloped neckline and short puffed sleeves. The dress closes in the back with small shell buttons and is finished with a scalloped hem topped with delicate pink and blue emproidery. 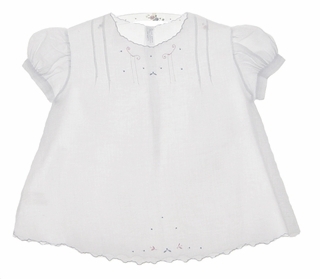 This would be a lovely heirloom portrait dress, christening, baptism, or dedication dress for your baby girl!